The list of their literary influences is immaculate – from the French symbolists to Oscar Wilde, it exclusively contains the heroes of hedonism –, that Frederic brings back to life in his lyrics. But also musically, The Glam are extremely powerful – within a very short period of time, The Glam have gained the reputation of being a daredevil stage sensation which they could achieve, amongst other things, thanks to Frederic’s sharp voice, for example, when he sings: »Hey you do you believe in spectres / Come on and join the defectors / Hey you and your policy / I prefer to live my reverie«… in the key song »Join The Spectres« .. .. The fact that The Glam relate to Gender Benders like T. Rex or David Bowie, who, in the 70ies shaped a new genre almost on their own, goes without saying. It gets congenial, though, when the band lets the beat of The Cure’s »Lullaby« shine through the accords in the song »Walking Ghost« with Frederic singing: »You are walking like a ghost / Don..t touch the ground / Tonight you..ll come around / Have you existed, have you ever really loved / Not me and not enough...«. 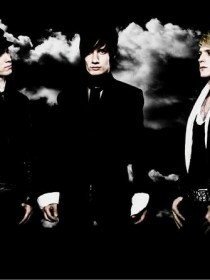 A song like »Walking Ghost« proves how competently The Glam already dominate their terrain. .. .. Their musical spectrum is remarkable, a wonderful example of which is the track »Moonlight Miles«, in which an excessive Glam-euphoria, surprising breaks and a determined, stirring voice crashes onto a hint of U2’s »Zoo Station«-phase. In moments like these, we can perceive that a great future lies before The Glam. .. .. 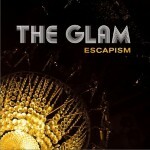 The Glam self-confidently call their sound »Widescreen Electric Guitars«. It is no coincidence that this expression stems from the film jargon. Frederic is an addict when it comes to French post-war films. So that it is no coincidence either that, in »Ariel Echoes«, he sings: »All the world in black and white / As if Truffaut had filmed my life at night / All your echoes come to stay / Like sirens sing, you sing my mind away...« When did we last hear such reflections from a singer’s mouth? .. .. The Glam are the proof that glam rock, strong melodies, a profound knowledge about the music from the past 30 years and, last but not least, the instrumentalists’ individual strength – that of Frederic , bass player Phil and drummer Julien – can be a forceful mixture.